A tropical retreat on the Atlantic Ocean, within the exclusive resort community of Key Colony Beach. . . right in the heart of the Fabulous Florida Keys. Our fine reputation for personal service and comfortable accommodations keeps our guests returning year after year to our beautiful Island resort. Just step out your door for a refreshing swim . . . lounge in the sun and then cool off under a thatched tiki or colorful umbrella. Stroll down to our palm shaded white sand beach and search for shells washed up by the waves or take a dip in the crystal clear ocean. Two gas fired barbecue grills on the beach are great for cookouts. Right out our entrance enjoy paths to bicycle, roller blade or take a leisurely stroll. The whole island has bike paths and the maximum speed limit is 25 mph! New Sunset Park is just next door to explore and of course, view one of our magnificent sunsets. Rent a bicycle or moped for leisurely sightseeing. A short drive takes you to fine shops and restaurants in nearby Marathon. Our apartments surround the heated freshwater pool and spacious patio. Accommodations are tastefully appointed and air conditioned to provide comfort and convenience, with full, queen and king bed units, fully equipped kitchen, dinette, living room, cable TV, and FREE local telephone calls. Daily housekeeping service is provided. A guest laundry is on the property. Click Image Above For Property Tour and Area Photos Click Here For Current Marathon Weather A par three lush green golf course awaits the golf enthusiasts or if you seek bigger game out on the blue Atlantic, Continental Inn is right in the center of the action. You can walk to the Key Colony Beach Park and Recreation Area to play with the kids or treat yourself to a round of golf or tennis. You've come to the right place for Fishing, Diving and Watersports! Key Colony has its own marina where charters and boat rentals are available. Explore our beautiful natural reefs on a diving or snorkel charter. For even more fun, take a day trip and visit nearby parks and museums. While staying at the Continental Inn, you can even encounter the Atlantic Bottlenose Dolphin and other sealife at the Dolphin Research Center or Theater of the Sea. Both facilities are nearby and welcome adults and children to participate in a variety of tours, shows and dolphin encounters. 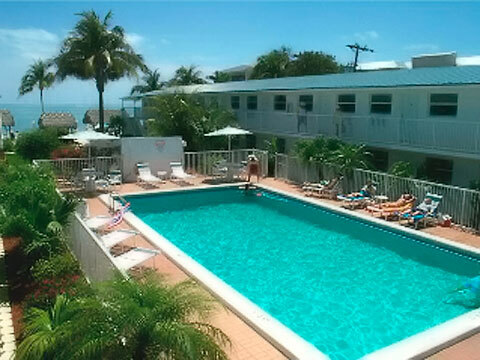 Stay in comfort and enjoy all of the Florida Keys from our convenient island resort! Located at mile marker 53.8 on prestigious Key Colony Beach - an island just 55 miles north of Key West and 110 miles south of Miami. Local directions from the NORTH: Follow Route 1 through Islamorada and Grassy Key. About 6 miles after Grassy Key, come to the intersection of Sadowski Causeway. You will see a blue oval "City of Key Colony Beach" sign on your left and a Citgo gas station on the corner. Turn left onto the Causeway and take the next right on West Ocean Drive. We're at 1121 West Ocean Drive, about 1/4 mile down on the left on the Atlantic Ocean. Local directions from the SOUTH: Follow Route 1 through Marathon over Vaca Cut bridge to the next traffic light and the intersection of Sadowski Causeway. You will see a blue oval "City of Key Colony Beach" sign on your right. Turn right onto the Causeway and take the next right on West Ocean Drive. We're at 1121 West Ocean Drive, about 1/4 mile down on the left on the Atlantic Ocean. " Imagine Yourself Here!"